The World War II generation and Baby Boomer generation, to some degree, lived in a time when the change that they carried in their pockets was actually composed of silver. 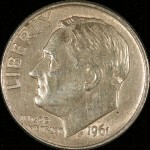 Up until 1965, the dimes, quarters and half dollars struck in the United States were composed of 90% silver. The aforementioned folks received this change all the time and many of them had change jars, boxes and old bags that they would throw this stuff into. Furthermore, casinos paid out in change, and yes it was 90%. Some people were smart enough to hoard 90% silver figuring that at some point in time it would have more value than the paper money that it could be exchanged at the bank for. There was also widespread publicity in the early 1960’s about the coming change in silver content of the United States coins, basically a debasement, but we can talk about that at another time. Point of the story is, almost every household in America has some quantity of 90% silver lurking in it somewhere. Now, most of the 90% silver is just worth its’ silver value but occasionally you might come into some 90% that has some better dates in it, and that is good for you. Also, 90% adds up very fast and with silver at current levels you would be amazed at what a coin jar full of 90% adds up to. So, to begin we should look at 90% in three parts: the dimes, the quarters and the halves. 1) 90% Dimes: With dimes, just like quarters, once the date on the coin says 1965 or later (later meaning towards the 21 century) you do not have to think about it having silver value anymore. Again, with dimes we only are looking at coins with a date of 1964 and before. The dime series struck by the United States is a huge series and for the purpose of this article we will talk about the types of dime designs that we see in the 90% category. They are the Barber dime, the Mercury dime and the Roosevelt dime. 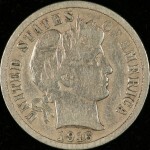 The Barber dime is a series that usually is found very worn when it turns up in 90%, usually in VG or below grades. Most of the better Barber coins were picked out of circulation long ago by kids, collectors and people home at night, board watching Andy Griffith and drinking McTarnahan’s scotch whiskey. But, in low grade it does exist in your typical batch of 90%. The second category of silver dimes is the Mercury Dime. Visually the Mercury Dime is a very appealing coin and people tend to get excited over this dime because it is rarely seen in circulation anymore. But millions and millions of these coins exist as 90% silver and it is seen almost as frequently as the Roosevelt Dime. 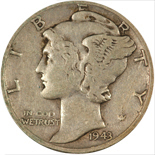 The Mercury Dime with usually be found in the Very Fine to Extremely Fine condition when it is found and most of the dates found in the average 90% silver collection are from the 1930’s to mid-1940’s. 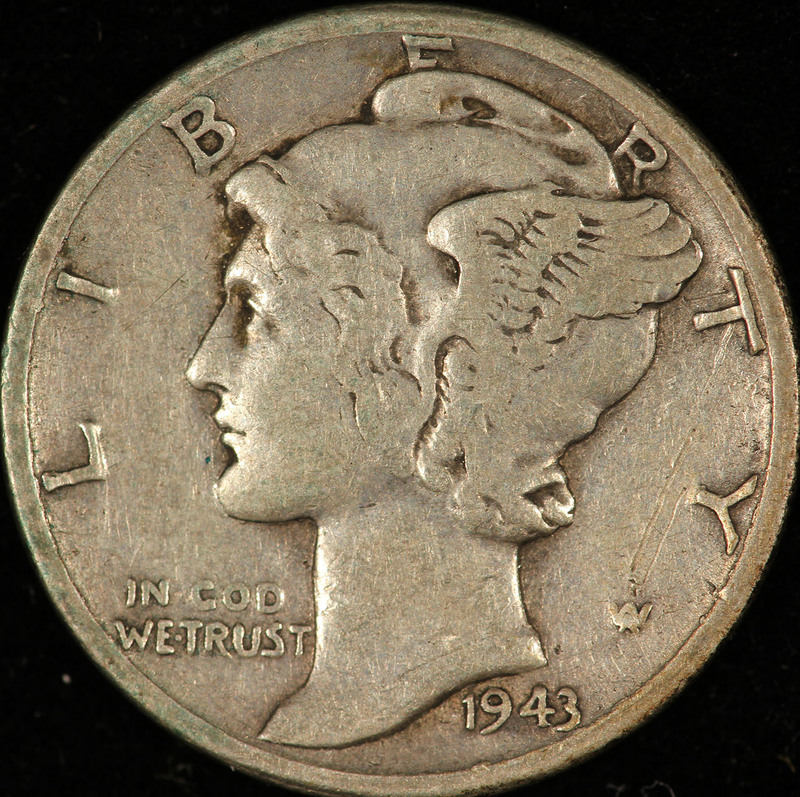 No matter how bad you want the Mercury Dime to be rare, it really does not happen unless you are dealing with key dates from the Series which were struck from 1916 to the mid-1920’s. 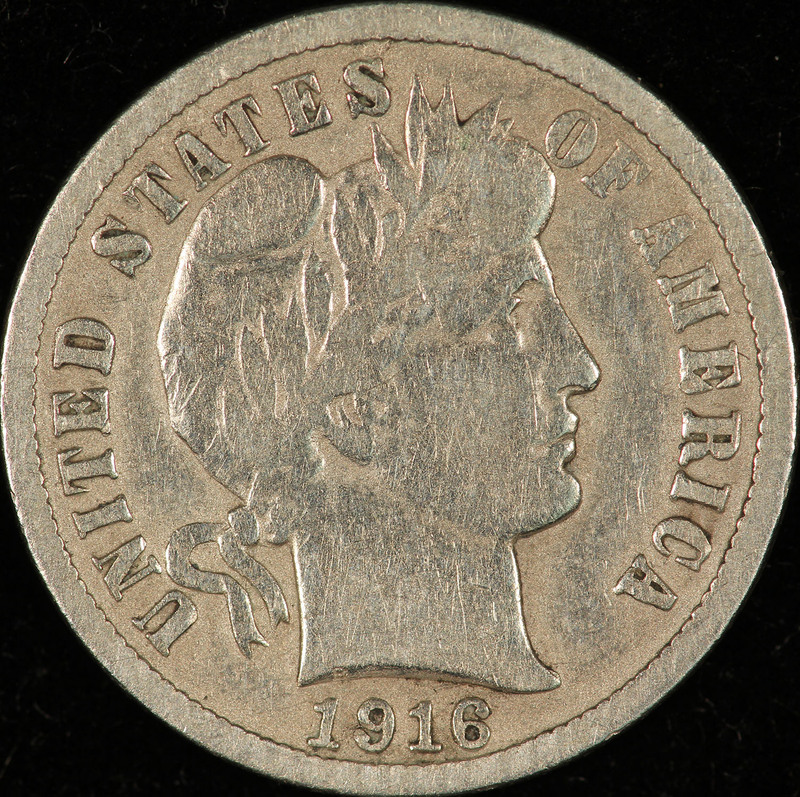 An example would the 1916-D, a legendary coin in the world of coin geekdom. 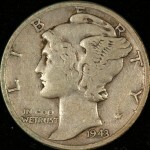 An exception would also be the 1942/1 Mercury dime, an overdate rarity. Again, the Baby Boomer generation pretty much spent an enormous amount of their spare time as kids and teenagers rummaging through change looking for these dates so you can thank them for depleting yet another one of our resources. The final category of dimes are the Roosevelt Dimes. This series of coins was struck from 1946 to the present. Only the coins from 1946 to 1964 have silver value. This series of coins goes down in history, in my opinion, as having not a single date/mintmark combination that has any value over its silver value. In theory the 1949-S is a better date, but it would have to be in near perfect condition to even realize a figure lessthan $100. By the way, there is a Full Torch Variety and I can assure you that I would rather do a swan dive off the 405 South than have to make a living “Full Torching” it. To all of you who are into Full Torch, I apologize, go back to watching Star Trek. So there we have it, most accumulations of 90% silver will have one of the three aforementioned dimes in it. 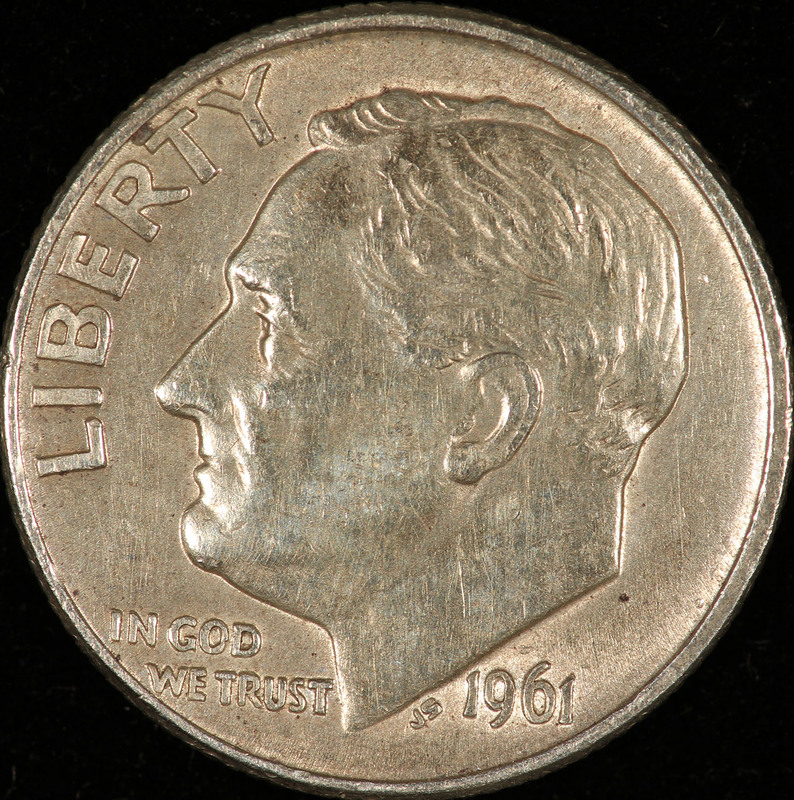 We now know that one does not have to worry about any rare coins in the Roosevelt dimes, they are just silver value and should be sold accordingly. If one were to come across a large group of Mercury Dimes, especially original rolls or rolls put together a long time ago, it would be worth it to have Meridian Coin look through them for better dates when they are brought in. The same would apply for the Barber Dimes, there are some better dates but they would have to be in better condition than how the average Barber dime looks when found in 90%. This article is aimed at helping the household or individuals learn how to understand their 90% before they bring it into our store. We are constantly buying 90% silver in small groups to bags. It goes without saying that we are always willing to buy 90% and if one should find some rare coins in their 90%, please give us the chance to make you an offer.